Social resilience is a community’s ability to not only respond to and recover from disasters, but also to build long-term capacity to maintain strong, safe, functioning systems at the neighborhood scale. Innovative, web-based tools can boost a community’s social resilience by helping to engage its citizens; identify and prioritize community needs; collect and analyze data; and monitor project implementation and success. This workshop brought together planners and government staff at The Rapides Foundation in Alexandria, Louisiana on February 19th to discuss the range of emerging web-based tools that are available to planners, emergency managers and citizens. Kate Gillespie, Director of Planning at Perez, APC, presented at the workshop and led an interactive group activity. Additional speakers, in order of appearance, included Jonathan Bolen, Assistant to the Mayor and Project Manager of the ThinkAlex planning project; Matt Sampey, a Community Fellow for ThinkAlex; and Jason Stopa, Neighborhood Development Manager with Beacon of Hope in New Orleans. The accompanying webinar on the same topic took place the preceding Friday, April 15, to provide an overview of the different tools being used in other cities across the country, with examples from both high- and low-density areas. Led by Frank Hebbert, Director of the New York-based 501(c)3 company OpenPlans, the webinar highlighted some of the benefits, successes and challenges in using these technologies, and he compared the different levels of expertise and investment required of communities to begin using these technologies. This page provides a summary and main takeaways derived from both the workshop and webinar. Emerging, innovative web-based technologies are reinventing approaches to community planning. Mobile applications can perform a wide variety of functions essential to planners, from mapping the capacity of disaster evacuation routes to locating and tracking potholes, blight and other neighborhood-scale issues. In addition, the increasing use of smartphones and tablets means that mobile applications can add value to the planning profession, particularly by increasing the productivity and efficiency of workflows, as well as by increasing engagement with citizens, government and other entities . Online mapping tools are helping to spatially depict and analyze community information, such as demographics, transportation and access to essential services like healthcare. Additionally, mapping tools are making it easier to overlay and view hazard data together with community information for purposes of planning, without expensive software or extensive technical expertise. Such tools are particularly beneficial for communities struggling with small staffs and shrinking budgets. Online tools and mobile applications are helping to break down barriers between disaster recovery, hazard mitigation and land use planning. Many of the applications developed for response to disasters are being applied to more chronic, systemic issues that can undermine a community’s social fabric. For instance, crowdsourcing is a process whereby information is solicited and collected from citizens. During and following a disaster event, emergency managers and local government are using social media and online apps to collect and map a variety of pertinent information in real time, such as to track affected populations and allocate resources to critical areas. However, crowdsourcing tools can be used to collect more targeted information of interest to planners and local government. In fact, the City of Alexandria is undertaking a project to improve its public transportation network, called ATRANS Improvement Plan (AIP), that uses a 311 mobile application called AlexConnects to address the lack of existing data on bus stops in the city. By soliciting feedback through press releases, the city’s public transportation users are helping to generate new data by using the app to input specific information about the location, type and conditions of bus stops. Ms. Gillespie’s presentation focused on the design of surveys for use in mobile applications. There are several advantages to using online applications to collect data for planning purposes, including improved data accuracy, faster data generation, compact data formats, streamlining processes, reduced data entry costs, quality assurance, and easier data analysis. When designing an online survey, she discussed the importance of first conceptualizing the flow of information to help inform the functionality and overall look and feel of the application itself. She offered several important considerations to take into account when designing an online survey for use in a digital device: 1.) the user’s experience and the desired amount and type of information the user will see at any particular time on a screen, 2.) the level of control versus flexibility over users’ responses and the nature of the data being solicited, which will largely depend on how the information is intended to be used and 3.) how the data will be fed into a database or spreadsheet for analysis. Ms. Gillespie also led an interactive activity, whereby participants broke out into groups of two to collect information on bus stops in downtown Alexandria. Using the AlexConnects app, citizens entered information about the location, type and overall conditions of each bus stop. The information crowdsourced by participants during the workshop will serve as a starting point for the ATRANS Improvement Program (AIP) underway in Alexandria. Mr. Bolen discussed new initiatives being developed by the City of Alexandria to encourage increased participation and collaboration in planning. The City’s SMARTAlex program uses new web-based applications to address a variety of issues related to land use, transportation and housing. The goals of the SMARTAlex initiative are to deliver better government services, make Alexandria work smarter and build a stronger community with less. By leveraging new technologies, SMARTAlex works to eliminate wasteful spending, streamline successful processes, and modernize government operations to save money and improve performance. The City’s AlexConnects app allows citizens to report and track non-emergency issues, from potholes to graffiti. The AIP is enabling the use of crowdsourced data to improve the city’s public transportation system, which in turn will support greater connectivity throughout the city and increase its capacity to handle emergency situations. The ThinkAlex project also features a wealth of community information and reports through their website and Facebook pages. The ThinkAlex planning team hired four Community Fellows to assist with community research, outreach and meeting facilitation throughout the duration of the planning process. Mr. Sampey has been a Community Fellow for almost a year, serving as an important liaison between the planning team and the public. Mr. Sampey spoke about the importance of direct, interpersonal communication with citizens, juxtaposing new technologies being used for outreach with more traditional methods of communication and outreach. While online tools and apps do a great job of readily disseminating information to the public, receiving feedback from the public requires a multipronged approach to reach all segments of the population. According to Mr. Sampey, getting feedback from citizens requires speaking directly with people via phone or in person, particularly to engage groups that do not use digital media regularly. A major issue with relying exclusively on web-based tools and apps is that these forms of communication can exclude populations that fall on the lower end of the socioeconomic ladder in particular. This ‘digital divide’ sheds insight on the fact that new tools and online apps are not meant to replace more direct forms of outreach and engagement, but rather should be used to supplement existing strategies. Moreover, web-based technologies are most effective when used in conjunction with other types of outreach and engagement. Mr. Stopa works for Beacon of Hope, a New Orleans-based non-profit founded in response to Hurricane Katrina initially to assist in neighborhood recovery but has since expanded to focus on quality of life issues in neighborhoods across the city. At the workshop, Mr. Stopa spoke about the ability of apps to support partnerships between organizations with similar interests. New partnerships can form around the use of apps for data collection, such as with the city code enforcement, city council, and New Orleans Redevelopment Authority, for example. Potential partnerships exist as well with nonprofits focused on similar issues, such as transportation or historic preservation. 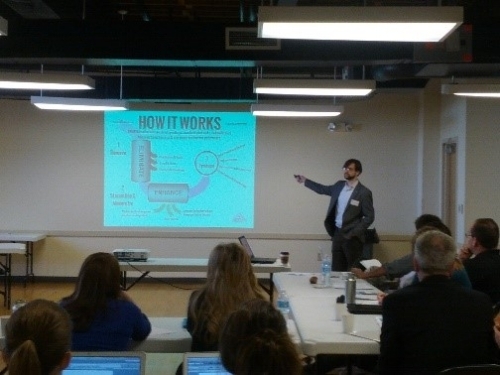 Mr. Stopa illustrated this point by showing how his organization developed a crowdsourcing app to facilitate resident-led data collection on property conditions, which led to partnerships with Project Home Again and the Lower 9thWard Center for Sustainable Engagement and Development. Mr. Stopa also spoke to some of the challenges and opportunities in working with new technologies. Limited capacity and resources, particularly with respect to time and funding, and keeping agencies engaged with the apps and in the overall process remain key challenges. In addition, groups do not always work together, which can reduce the effectiveness of web-based tools. Other considerations include data sharing and ownership, as well as whether crowdsourcing the data is indeed the most appropriate method. Conversely, apps can be used to solicit data in a timely manner from citizens who want to provide such data. Input can be continuous and ongoing, without the need for meetings. Lastly, Mr. Stopa spoke about online GIS tools that make crowdsourcing information easy, such as through hosting maps on a server and adding data to maps through applications. Technology is helping to break down barriers between disaster recovery, hazard mitigation and land use planning. Web-based applications being used in the emergency management field are being adopted and modified for use in land use planning. Many crowdsourcing apps serve dual functions for both disaster response and land use planning, effectively creating stronger synergies between these fields. For example, the AlexConnects app is currently being used to address non-emergency issues; however, the city hopes to expand its use for disaster events as well, such as by showing flooding, traffic, bus and rail information in real time. Crowdsourcing tools can generate community-driven data for communities struggling with small staffs and tight budgets. Using crowdsourcing apps together with digital forms and surveys to collect specific types of information has greatly improved the speed and consolidation of data collection. Web-based tools and apps can help planners and governments reach populations that might not otherwise participate in the planning process through more traditional town meetings and focus groups. While web-based tools and apps allow planners and governments to reach much larger audiences, these tools are most effective when used in conjunction with interpersonal modes of outreach and engagement. Traditional forms of outreach should target people with high ‘centers of influence,’ such as pastors, mayors, leaders of civic groups, etc. Web-based tools are not meant to replace more traditional methods of engaging with communities but, rather, are meant to supplement existing outreach activities. There is growing interest in funding the development and use of web-based technology at the national level. The Federal Government is encouraging grants for communities to develop apps for use in disaster response and planning, in addition to other forms of data collection. Web-based tools can help increase government efficiency to help build stronger communities. The increasing use of new technologies allows community issues to be presented in new ways. For instance, engaging apps and online games offer fun, interactive mediums by which citizens can share their ideas, concerns and future visions for their communities with their neighbors and community leaders. Web-based tools and social media provide new sources of citizen data. Local government and planning staffs can benefit from these data, while citizens can become more engaged and empowered in the decision-making process.